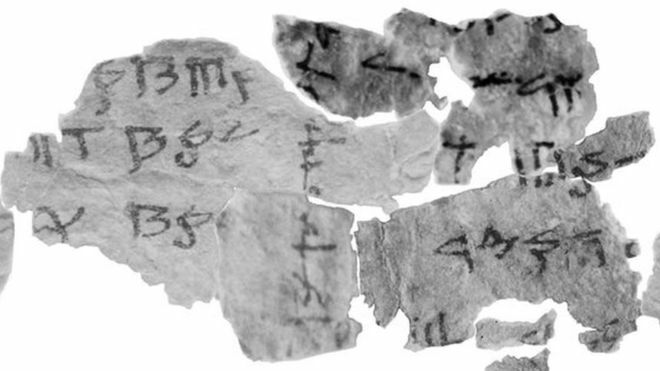 One of the last remaining obscure parts of the Dead Sea Scrolls has been deciphered by researchers in Israel. Sixty tiny fragments were pieced together over a period of a year, identifying the name of a festival marking the changes between seasons. The 900 scrolls, written by an ancient Jewish sect, have been a source of fascination since the first were discovered in a cave in Qumran in 1947. The collection is considered the oldest copy of the Bible ever found, dating to at least the 4th Century BC. It is not known who wrote the scrolls, although some scholars have credited an ascetic desert sect called the Essenes. The sections of the scrolls were pieced together by Dr Eshbal Ratson and Prof Jonathan Ben-Dov of Haifa University. They were written in code and some of the fragments were smaller than 1 sq cm (0.155 sq inches). They detailed special occasions celebrated by the ancient Jewish sect, which observed a unique 364-day calendar. These included festivals of New Wheat, New Wine and and New Oil, which were related to the Jewish festival of Shavuot. The researchers also discovered the name used by the sect for a festival observed four times a year that marked the transition between the seasons – Tekufah. The same word in modern-day Hebrew means “period”. They said they were assisted in deciphering the code by annotations discovered in the margins by a scribe correcting omissions made by the author. “What’s nice is that these comments were hints that helped me figure out the puzzle – they showed me how to assemble the scroll,” Dr Ratzon told the Haaretz newspaper. The priceless Dead Sea Scrolls were found in caves in Qumran on the western shore of the Dead Sea between 1947 and 1956. They were reportedly first discovered by a young Bedouin shepherd searching for lost sheep.